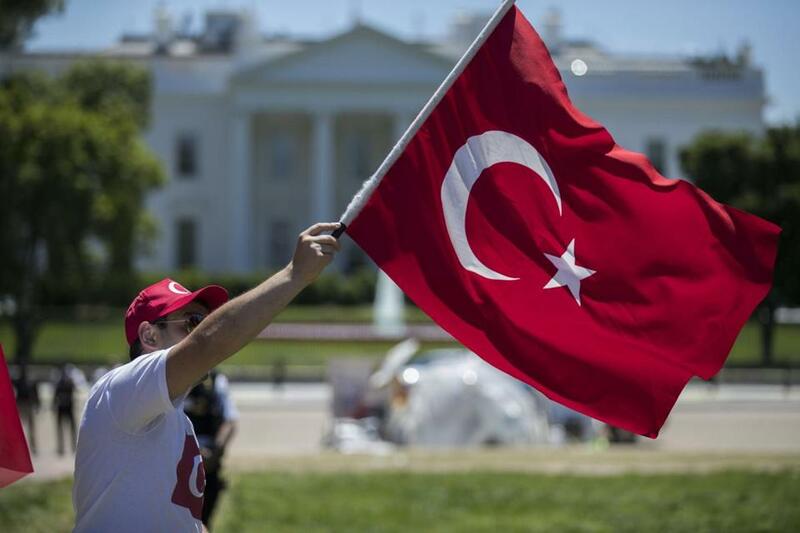 Demonstrators wave the Turkish flag in Lafayette Park in Washington during meetings between President Recep Tayyip Erdogan and President Donald Trump at the White House. after Turkish security guards violently attacked protesters who were peacefully demonstrating in Washington. That’s reprehensible — but not a surprise, given Trump’s personal contempt for First Amendment rights. On the campaign trail, he said he’d like to punch a protester in the face and longed for the days when protesters could be, as he put it, “carried out on a stretcher.” At one rally he famously urged supporters to stand ready “to knock the crap out of” hecklers. Trump also has a soft spot for bullies like Turkish President Recep Tayyip Erdogan, who looked on as this brutal assault unfolded. But this is America, where the people’s rights are enshrined in the Constitution, not Turkey, where a strongman rules by muscle and whim. The Erdogan thugs who injured 11 people, including a police officer, should be held accountable, no matter how difficult that may be. Erdogan and his security force are back in Turkey. However, according to The New York Times, two people were arrested after the confrontation: Ayten Necmi of Woodside, N.Y., who was charged with aggravated assault; and Jalal Kheirabaoi, of Fairfax, Va., who was charged with assault on a police officer. Through video, others can also presumably be identified. The shocking attack occurred on May 16, after Trump welcomed Erdogan to the White House, with praise for an ally in the fight against terrorism – and no mention of Erdogan’s crackdown on opponents back home in Turkey. Later that day, Erdogan’s security guards violently attacked protesters who were demonstrating outside the Turkish ambassador’s residence. Video released by The Voice of America’s Turkish Service, shows Erdogan watching the confrontation from a black Mercedes parked nearby. But without the president’s voice, how strong, really, is that concern? Trump still doesn’t get it or just doesn’t care. Up until he took office, American presidents understood the important role they play as leaders of the free world. When constitutional rights come under attack, they knew that speaking up matters to America and the world. With Trump, there is no voice of moral authority. There is only shameful silence when foreign security forces beat up American protesters in the nation’s capital.